We’ve written before about Ivanka Trump’s sinking clothing line, as the American public votes with its wallet and turns away from things labeled Trump. 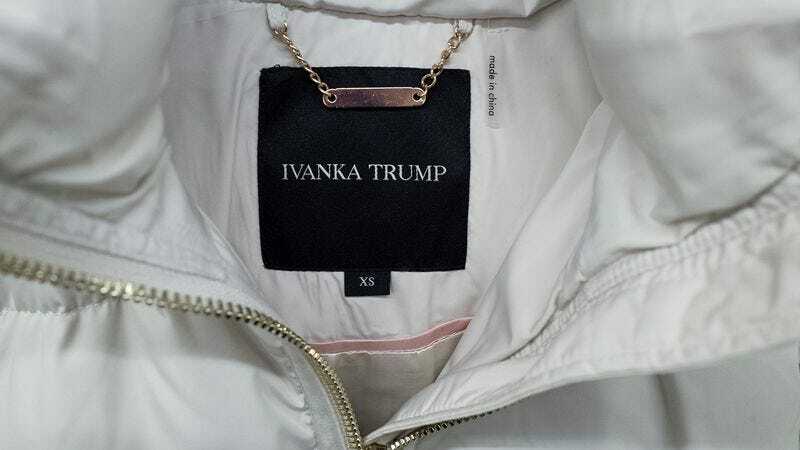 Things have gotten so bad, in fact, that the only way to sell Ivanka Trump sportswear is to take her name off of it and replace it with someone else’s. At any rate, the switching of labels is surprisingly not illegal, as fashion law professor Susan Scafidi explains to Business Of Fashion, “U.S. textile product labelling laws allow substitution of labels, so long as the entity making the substitution is identified on the new label.” She continues, “Of course, the fact that a clothing retailer can legally relabel with certain restrictions doesn’t mean that it should, especially if label-conscious consumers are likely to be outraged by the switch.” Outraged is the right word here, as consumers have been fleeing from the Ivanka Trump brand, which has also been dropped by retailers like Nordstrom and Neiman Marcus. Business Of Fashion reports, “According to a source within Stein Mart, the retailer has received negative feedback from customers regarding Ivanka Trump product, with one customer spitting on a blouse in front of a cashier before storming out of a store.” Hard to sell a blouse that inspires that kind of reaction; no wonder they switched the name.